Rosemary (Rosmarinus officinalis) is generally easy to grow, but sometimes it can have problems. To track down the cause of yellowing leaves on a rosemary plant, check which leaves are yellow. If only some of the leaves are yellow, the problem may be different than if all are yellow. Also check if the leaves are completely yellow or if they have a speckled appearance, which may provide another clue. Proper care of your rosemary plant may be able to save it. If not, knowing what the problem was can help you to have a healthy plant next time. A lack of necessary nutrients can cause a rosemary plant to have yellow leaves. The most common cause of yellow leaves is a lack of iron. The problem may also be caused by insufficient nitrogen, zinc or manganese. If the problem starts on young leaves and spreads to the old ones, it's likely an iron deficiency. If the first leaves to turn yellow are the oldest ones, it could be nitrogen, zinc or manganese that's missing. What your rosemary plant most likely needs to correct nutrient deficiency is fertilizer. Add fertilizer every month or two while the plant is growing, but no more than one or two times during winter dormancy. Use a basic water-soluble fertilizer such as 20-20-20 with micronutrients and mix 1 teaspoon of fertilizer with 1 gallon of water. If the soil pH is too high, iron may be present in the soil but your rosemary won't be able to use it. Check the soil pH with a test kit or pH probe. If your soil pH is 7.0 or higher it is too alkaline. Other imbalances that can cause trouble with the uptake of iron include too much copper, phosphorous, zinc, calcium or manganese. Too little potassium in the plant and too little iron in the soil will also turn leaves yellow. Repot houseplants to resolve such problems. For outdoor rosemary, use a soil test kit and then follow the label's recommendations for the results you get. While rosemary grows outdoors in U.S. Department of Agriculture plant hardiness zones 8 through 10, you can also grow it as a houseplant. Root rot is the most common reason for a yellowing houseplant. If your plant has this condition you'll see stunted yellow leaves as well as overall stunted growth. Rosemary prefers dry soil, and too much water can trigger root rot. 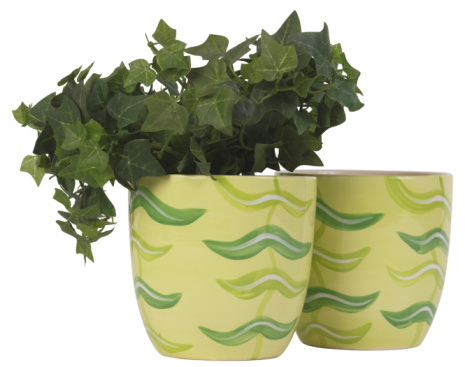 Take a look at the roots by carefully removing the plant from its pot and exposing the roots. Plants with root rot will have at least some black roots and the roots will look slimy. Healthy roots are white and firm. If only a few roots have rot, you may be able to save the plant by increasing drainage and cutting back on watering. Allow the plant to dry out completely between waterings, and don't let it sit in a tray of water at any time. If spider mites are feeding on your rosemary, the leaves may be spotted with yellow. If you look closely you may also see webs where the leaves join the stems. Left untreated, these pests can kill your plant. Set your plant in the bathtub or take it outside and wash it down with a forceful spray of water to remove many of the spider mites. Repeat this each week until the problem is gone. Make sure your rosemary isn't getting too dry between waterings, which can increase the chances of spider mite problems. Rosemary plants need full sun, about six to eight hours a day, and indoor plants require plenty of supplemental light. If your plant gets inadequate light it may struggle to survive. The lower leaves on the plant will turn yellow and drop off. To prevent yellowing and other light-related problems, set your rosemary in a sunny south- or west-facing window where it gets enough sunlight. Supplement as needed with a grow light or standard fluorescent lighting. Place the fluorescent lights about 6 inches above the rosemary and leave them on about 14 hours a day. Use a timer to automate the light turning on and off.